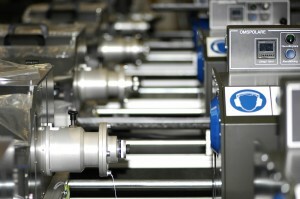 Simplifies handling of fibre optic cable. 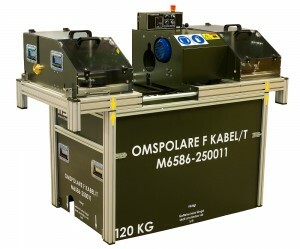 RWS500 is designed and produced upon a functional specification from the Swedish armed forces to provide them with modern and easy usable cable rewinding equipment. RWS500 is an easy operational cable rewinding system, facilitating washing, fault detection, winding and maintenance of fibre optic cable. The machine is controlled either via pedal for hands free operation or via push buttons. Rewinding speed: 1,2 m/s. The system is stored inside the custom made case, also constituting the stand when the machine is mounted for use. The case has the measures of a standard 1200 x 800 mm pallet. The built-in drawer has room for tools and equipment making the RWS500 ready to set up anywhere at any time. The machine could be used both indoors and outdoors within the temperature range of -10ºC to +40ºC. Mode A: Cable rewinding from left cable drum to the right cable drum. Mode B: Cable rewinding of uncoiled cable.